Anthony Thigpenn is an Executive Director of AGENDA and an Apollo Alliance National Advisory Board member. Anthony Thigpenn was a member of the Black Panther Party. In 1970 Michael Zinzun joined the Black Panther Party. In the mid 1970s he joined Los Angeles-area anti-police brutality activists B. Kwaku Duren and Anthony Thigpenn to form the Coalition Against Police Abuse . The organization investigates allegations of abuse, provides support for victims and families, and agitates for justice in street demonstrations and courtrooms. CAPA acknowledges a direct descent from the Black Panther Party, with many former BPP members, but is a distinct organization many of whose members critique what they see as the intensely hierarchical and patriarchal tendencies of the now defunct BPP. Almost from the moment of CAPA's inception the LAPD infiltrated and placed it under surveillance. The techniques used by the LAPD in spying on and undermining the organization closely resembled those used by the FBI COINTELPRO program. CAPA joined with other similarly victimized organizations to sue the department and won a monetary settlement and assurances that similar practices would not be reimplemented. Nonetheless it is the belief of many CAPA members that they are still targeted by the LAPD and other government agencies for domestic espionage, infiltration, and sabotage. As a result of the lawsuit the LAPD disbanded the Public Disorder Intelligence division responsible for the original infiltration. After the 1979 police shooting death of Eula Love in South Central Los Angeles CAPA proposed a civilian police review board, modeled on similar boards in other cities, that would have had the power to fire and otherwise discipline abusive police officers and change police policies. A petition in favor of the review board did not garner enough signatures to place it on the ballot. Nonetheless, the effort was successful in helping the organization become better known in South Central. In March 1998 “Endorsers of the Call” to found a Black Radical Congress included Anthony Thigpenn, Chairman of the Board, Action for Grassroots Empowerment & Neighborhood Alternatives, Los Angeles. Endorsers of the project included Anthony Thigpenn, Strategy Concepts in Organizing and Policy Education. 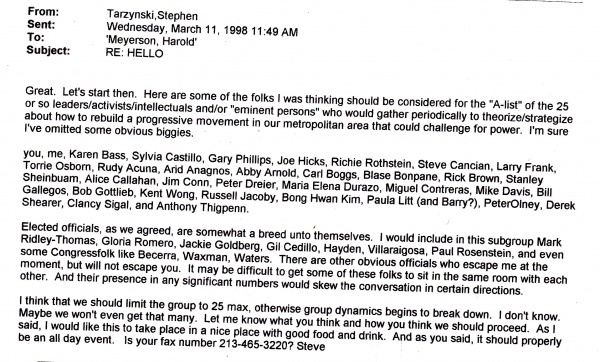 Circa 2002 , Anthony Thigpenn, AGENDA/Metropolitan Alliance, served on the Advisory board of the Democratic Socialists of America dominated Progressive Los Angeles Network. In 2005, Thigpenn ran the field campaign for Antonio Villaraigosa. 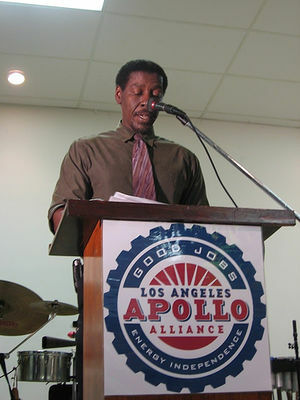 Anthony Thigpenn runs an organization in California called SCOPE [Strategic Concepts in Organizing and Policy Education]. He’s really an organizer. He’s been doing a lot of community organizing and environmental justice, and has worked to build alliances with labor and community organizations. In 2006, Thigpenn, served on the National Advisory Board of the Apollo Alliance. 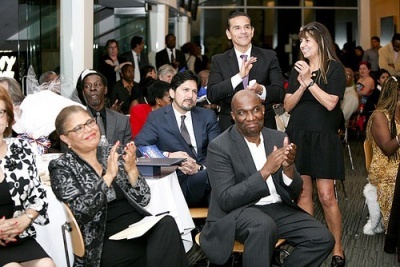 Also endorsing Antonio Villaraigosa's 2001 mayoralty bid were Bill Burke, the founder and president of the Los Angeles Marathon; Cynthia McClain-Hill, a member of the California Coastal Commission; Turning Point magazine executive Patricia Means and community organizers including Anthony Thigpenn and Karen Bass. We have an amazing team of advisors and thought partners that help us shape our strategies. New World Foundation leads by example. Our Board is made up of social justice practitioners, past and present grantees, movement thinkers, and leaders. ↑ "Kevin Uhrich and André Coleman, contributing by Tracy Spicer (2006-07-13). ["Michael Zinzun 1949-2006: Ex-Black Panther spent much of his time and money battling for social justice". Pasadena Weekly. Retrieved 2006-09-29. This page was last modified on 17 September 2018, at 13:30.